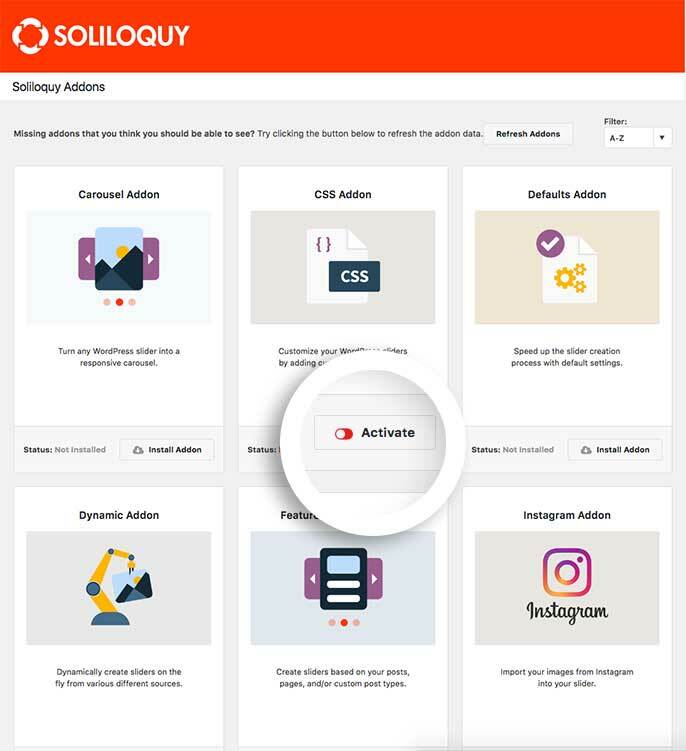 You’ve just purchased a Soliloquy license that grants you either basic or advanced add-ons. If you’re not sure what to do after installing Soliloquy and verifying the Soliloquy license key, this tutorial will walk you through the next steps. How do I update my Addons? First, you’ll need to log in to your WordPress site. From the WordPress menu on the left, select Soliloquy » Addons. From the Addons screen, select the Install button for the addons you want to install. Note: The addons available with your specific license will appear available to install on this screen. If you’re looking for a specific addon that isn’t available, check that you have the required license for that addon. Once your addons are installed, the button text will change to Activate. 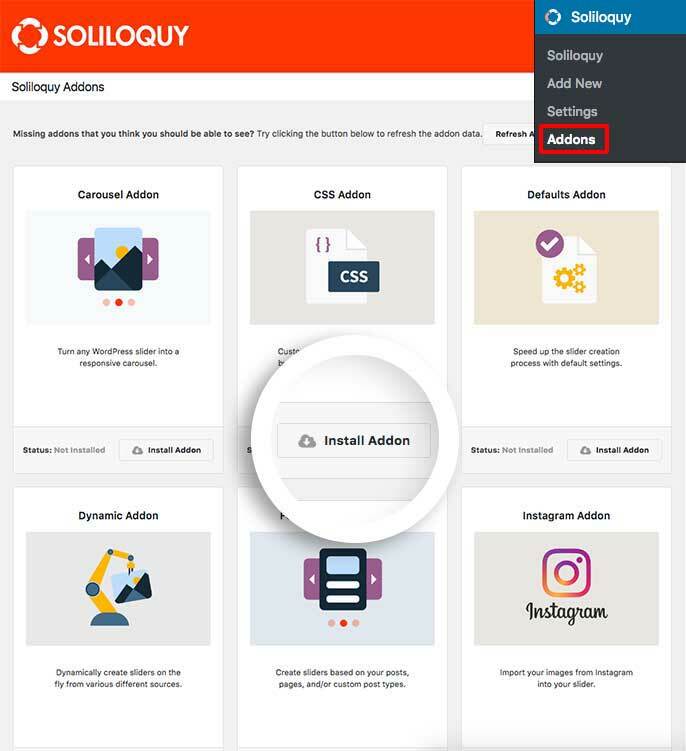 Click this to activate the Soliloquy addons on your site. If you want to deactivate any addon, you can do so from the same screen by selecting the Deactivate button for the specific addon. Congratulations, you’ve finished installing and activating your addon(s)! Now that you’ve installed your addon(s), learn how to use and configure your Addons. And if you have already, learn more about creating your first slider. Q: How do I update my Addons? 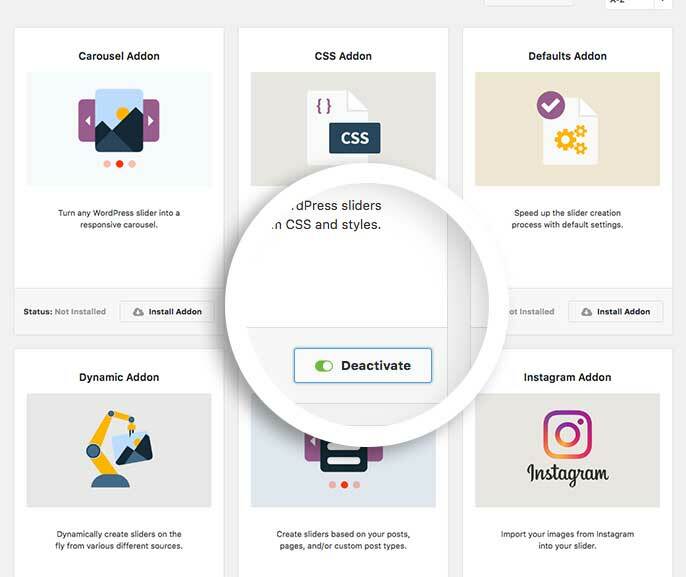 A: You can navigate to the WordPress Admin » Plugins screen and update any installed Addons from the Plugins overview screen just like any other plugin you’ve installed on your site.